Location of Freeport in Stephenson County, Illinois. 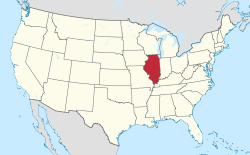 Freeport is the county seat and largest city of Stephenson County, Illinois. The population was 25,638 at the 2010 census, and the mayor of Freeport is Jodi Miller, elected in 2017. Freeport is known for hosting the second Lincoln-Douglas debate of 1858, and as "Pretzel City, USA", named after the heritage of its Germanic settlers in the 1850s and the Billerbeck Bakery pretzel company that started as a result of their arrival. Freeport High School's mascot is the Pretzel to honor this unique heritage. The community was originally called Winneshiek. When it was incorporated, the new municipality took its name from the generosity of Tutty Baker, who was credited with running a "free port" on the Pecatonica River. The name "Winneshiek" was later adopted, and is preserved to this day, by the Freeport Community Theatre Group. In 1837, Stephenson County was formed and Freeport became its seat of government in 1838. Linked by a stagecoach with Chicago, the community grew rapidly. In 1840, a frame courthouse was erected and the first school was founded. Within two years, Freeport had two newspapers and in 1853, the two were joined by a third which published in German. By then, the community had a population of 2,000. On August 27, 1858, the second debate between Abraham Lincoln and Stephen A. Douglas took place in Freeport and gave the nation direction in the following years. Although Stephen Douglas won the election and retained his U.S. Senate seat, his reply to a question on slavery alienated the South, which called it the "Freeport Heresy", and split the Democratic Party. This enabled Abraham Lincoln to win the Presidency in 1860. A monument to the debate was dedicated in 1903 by President Theodore Roosevelt and stands at this site. A life size statue recreating the event was dedicated in 1992. Another renowned statue, Lincoln the Debator by Leonard Crunelle, is a focal point in the city's Taylor Park. In many years there is also a reenactment of the debate, which has been shown on C-SPAN. Freeport is known as the "Pretzel City", and its public high school's team is named the Pretzels. The nickname is a reminder of Freeport's ethnic heritage; in the late 1850s, many Germans, both from Pennsylvania and from their European homeland, resettled in Stephenson County bringing with them their love of pretzel snacks. In 1869, a German immigrant named John Billerbeck established the Billerbeck Bakery, which distributed so many pretzels to residents that the local newspaper later dubbed Freeport the "Pretzel City". The city later capitalized on this nickname in 2003 by starting Freeport's first Pretzel Festival. Freeport is home to the oldest Carnegie Library in Illinois and one of the first Carnegie Libraries designed by the famous Chicago architectural firm of Patton and Miller. It was renovated into Freeport's City Hall  and City offices were moved to Carnegie City Hall in February 2017. The City of Freeport transitioned to the City Manager Form of Government in May 2017. The first City Manager is Lowell Crow. Before February 1893, a large square of land was purchased from the former Keller-Wittbecker farm in East Freeport. Some of this land had recently[when?] been subdivided and platted as the "Arcade Addition". The Arcade Manufacturing Company had been in operation since 1885 when the previous Novelty Iron Works had gone out of business at the corner of Chicago and Jackson streets. That earlier company began as early as 1868. After the 1892 fire, the Arcade Manufacturing Company built an entirely new factory in the Arcade Addition of East Freeport, where they produced coffee mills and other metal products. The historic Germania Club on Stephenson St. collapsed in 2007. Freeport is located approximately 20 miles (32 km) south of the Wisconsin state line, and at the center of a large agricultural area, located about 25 miles (40 km) west of Rockford. According to the 2010 census, Freeport has a total area of 11.79 square miles (30.54 km2), of which 11.78 square miles (30.51 km2) (or 99.92%) is land and 0.01 square miles (0.03 km2) (or 0.08%) is water. U.S. Route 20 is a four-lane divided highway that skirts the community's northern edge. At Rockford, it links with Interstates 90 and 39, giving Freeport residents access to the entire Interstate system. I-90 is the major route between Boston and Seattle. I-39 extends from Rockford to Bloomington, where it links with I-74 and I-55. From Freeport, U.S. 20 continues west to Galena, and the metropolitan area of Dubuque, Iowa. The area code for Freeport is 815 with an overlay area code of 779 as of March 17, 2007[update]. As of the census of 2000, there were 26,443 people, 11,222 households, and 6,845 families residing in the city. The population density was 2,316.9 people per square mile (894.8/km²). There were 12,471 housing units at an average density of 1,092.7/sq mi (422.0/km²). The racial makeup of the city was 81.77% White, 13.81% African American, 0.19% Native American, 0.97% Asian, 0.04% Pacific Islander, 1.00% from other races, and 2.22% from two or more races. Hispanic or Latino of any race were 2.12% of the population. There were 11,222 households out of which 28.4% had children under the age of 18 living with them, 45.1% were married couples living together, 12.6% had a female householder with no husband present, and 39.0% were non-families. 33.7% of all households were made up of individuals and 15.1% had someone living alone who was 65 years of age or older. The average household size was 2.29 and the average family size was 2.93. In the city, the population was spread out with 24.5% under the age of 18, 8.5% from 18 to 24, 27.8% from 25 to 44, 21.2% from 45 to 64, and 18.1% who were 65 years of age or older. The median age was 38 years. For every 100 females, there were 87.1 males. For every 100 females age 18 and over, there were 83.8 males. The median income for a household in the city was $35,399, and the median income for a family was $43,787. Males had a median income of $35,870 versus $25,095 for females. The per capita income for the city was $18,680. About 9.9% of families and 13.1% of the population were below the poverty line, including 18.6% of those under age 18 and 9.5% of those age 65 or over. Don Opel Arboretum, a botanical garden with over 3,000 different species of ground coverings, trees and shrubs. Krape Park was awarded "Outstanding Multi-use Facility" award by the Illinois Parks and Recreation Association. Heavily wooded Krape Park features a picturesque waterfall that tumbles down from a high limestone bluff. One can ride paddle boats, play mini golf, disc golf, or play on one of the three playground areas. Bidwell Park a 2-acre (8,100 m2) park presented by the heirs of Orlando B. Bidwell, features a small shelter with restrooms, a softball field, and a playground. Knowlton Park, a 1-acre (4,000 m2) park presented by the descendants of Dexter A. Knowlton to mark the 100th anniversary of his arrival to Freeport, features a bronze tablet and tall black maple trees to shade benches and play equipment. Read Park features the Read Park Family Aquatic Center and a skate park. One of the larger parks in Freeport, it also features a large pavilion, basketball courts, children's playground, shuffleboard courts, tennis courts, and softball fields. It is also home to the newly added Little Cubs Field. Oakdale Nature Preserve has over 133 acres (0.54 km2) of forests, streams and restored prairies including more than four miles (6 km) of trails as well as a 1/3-mile hard-packed accessible trail. It includes a lodge, an auditorium and a nature center. Wilbur Park, a 1-acre (4,000 m2) park donated by local industrialist W. T. Rawleigh and named after his son (who died during World War I), was deeded over to Freeport Park District on July 13, 1948. The park features landscaped terrain and playground equipment. Highland Community College offers 68 degree and certificate programs. Columbia College-Freeport, located on the Highland Community College campus. Local Freeport media includes WFRL (1570 AM), WFPS Radio (92.1 FM) and The Journal Standard daily newspaper. ^ "Office of Mayor". City of Freeport. Archived from the original on July 14, 2017. Retrieved May 24, 2017. ^ a b "Population and Housing Unit Estimates". Archived from the original on May 29, 2017. Retrieved June 9, 2017. ^ "Fifteenth Judicial Circuit". State of Illinois. Archived from the original on 2014-05-19. Retrieved 2014-01-20. ^ Chicago and North Western Railway Company (1908). A History of the Origin of the Place Names Connected with the Chicago & North Western and Chicago, St. Paul, Minneapolis & Omaha Railways. p. 74. ^ B. Eilders. "John Billerbeck (1835-1899) » Stamboom familie Eilders » Genealogie Online". Genealogie Online. Retrieved September 27, 2015. ^ "Let's twist again". tribunedigital-chicagotribune. Archived from the original on September 27, 2015. Retrieved September 27, 2015. ^ Blair Thomas. "Pretzel City Festival in Freeport". Illinois Farm Bureau Partners. Retrieved September 27, 2015. ^ "About Us - Freeport Public Library". ^ Writer, Derrick Mason Staff. "Freeport Carnegie Library-City Hall renovations on schedule". Archived from the original on 2017-03-15. ^ Reference to the ebook History of Stephenson County Illinois, Arcade Manufacturing Company, page 510 Archived 2014-08-13 at the Wayback Machine. ^ "Monthly Averages for Freeport, IL". Archived from the original on 2011-05-22. Retrieved 2008-02-28. ^ "Census of Population and Housing - U.S. Census Bureau". Census.gov. 2013-02-20. Archived from the original on 2013-10-01. Retrieved 2013-06-14. ^ "Official site". Stephenson County Historical Society Museum. Archived from the original on 18 December 2015. Retrieved 11 December 2015. ^ "Official site". Freeport Art Museum. Archived from the original on 18 December 2015. Retrieved 11 December 2015. ^ "Blackhawk Elementary School". Freeportschooldistrict.com. Archived from the original on 2012-03-14. Retrieved 2013-06-14. ^ "Empire Elementary School". Freeportschooldistrict.com. Archived from the original on 2012-03-01. Retrieved 2013-06-14. ^ "Lincoln-Douglas Elementary School". Freeportschooldistrict.com. Archived from the original on 2012-03-14. Retrieved 2013-06-14. ^ "Taylor Park Elementary School". Freeportschooldistrict.com. Archived from the original on 2012-03-14. Retrieved 2013-06-14. ^ "Aquinis Catholic Schools - Freeport, IL". Aquinschools.org. Retrieved 2013-06-14. ^ "Tri-County Christian School". Tricountychristian.org. Retrieved 2013-06-14. ^ "Highland Community College". Highland.edu. Archived from the original on 2013-06-03. Retrieved 2013-06-14. ^ "Columbia College Freeport at Highland Community College". Ccis.edu. Retrieved 2013-06-14. ^ "Staff Directory". Essanay Studios. Archived from the original on 11 February 2015. Retrieved 7 March 2015. Wikimedia Commons has media related to Freeport, Illinois. Wikivoyage has a travel guide for Freeport, Illinois.